But it doesn’t have to be that way. I have discovered that it is possible to get veterinary pet insurance for ferrets! And it doesn’t need to be cost prohibitive. This insurance is Pet Assure. What’s more, there are no exclusions–even pre-existing conditions are covered. Plus, there are no age limits and you can start using the coverage right away and get a 25% discount! If you have more than one ferret (most of us do! ), you can insure them all together at a discount! You don’t need to get separate insurance for each pet. All types of pets are covered. You can insure your 3 ferrets, cat and dog all under one plan–for about $200 per year! Or a single pet for less than $100. Regular pet insurance rarely covers ferrets. It normally only covers cats or dogs. It typically covers 70%-90% of the vet bill after you’ve met your deductibles. But, there are a lot of exclusions. The fine print on these policies often excludes hundreds of services and treatments. Many insurance policies make you choose which medical conditions you want covered. The more that is covered, the more it costs. So you are forced to make decisions such as do I want to pay an additional $25 per month in case my pet gets cancer? I checked out several pet insurance providers for one of my dogs (because they don’t cover ferrets, of course) to investigate their plans. I looked at Trupanion and Healthy Paws, 2 top pet insurance carriers. Both had exclusions such as pre-existing conditions, routine wellness, and office visits and exams. Some deductibles applied to each separate condition. So if your pet had to have a tooth pulled you would pay the deductible and if later she hurt her paw and needed surgery, you would again pay the deductible. Pet Assure’s veterinary discount plan may not only be a great way to save money on vet bills, but it may be the only veterinary pet insurance that covers ferrets! The only problem I have found with this insurance is that not all vets accept it. This is true of other veterinary pet insurance as well. Veterinary practices have to sign up to be part of their participating vets. You can do a search on their website to see a list of vets within 10 miles of your zip code. I entered my zip code and 9 vet offices came up. Of course, you have to make sure the vet treats ferrets. If you have a vet and she is not listed, you can also submit a request for your vet to join Pet Assure. 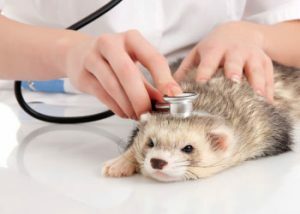 If you can’t find a nearby vet that treats ferrets and you have other pets, you may want to consider getting the insurance from Pet Assure for them anyway. It could save you a lot of money. They even offer a 45-day money back guarantee. So you can check it out risk-free. Sign up online and get your ferret (and other pets) covered. Click on the banner. I guess we all have had a bit of a love – hate relationship with insurance companies through the years. We do want our pets to be insured regardless of what type of animal it is, so it’s good that you found this company. Yes, Cat. Vet bills can really pile up. I think Pet Assure is a great way to help pay for a pet’s medical bills. I had no idea pet insurance even existed! Our dog just had to have an ACL surgery. One year later she tore her other ACL and had to have that one repaired. I wish we had pet insurance! It was almost 4,000 dollars after everything! Do ferrets have many health problems? What’s their typical lifespan? Do they do well around kids or are they pretty tame with them? Thanks for another great article! Thanks for your comments and questions, Sam. That is too bad about your dog. I hope she is doing well. You may want to seriously consider Pet Assure for your dog. It could really save you money, even on routine vet visits. Ferrets can live 15 years or more, but 5-8 years is more typical. That is the hard part of having ferrets, they are so full of life and energy but often they have a short life. But they make the most of it and approach each day as a new adventure! There are several conditions that ferrets are prone to and need treatment and/or surgery for. So it is a great idea to get ferret pet insurance. Ferrets and kids usually get along great and have a lot of fun together, but it is best to introduce a ferret into your home after all children are old enough to be taught how to handle and treat a ferret, so as not to accidentally hurt the ferret. Ferrets are tough, but they are tiny and like to get under foot. Helpful info on pet insurance for ferrets. I took my ferret to the veterinarian last week and had wished I had pet insurance for her. I will definitely look into getting this pet insurance for my ferret. I’m glad you found the info on veterinary pet insurance for ferrets helpful. Let me know if you have any questions.